K9 Immunity Plus™ is a chewable wafer product, containing all the immune-active polysaccharides from the original K9 Immunity™capsules, the immuno-proteins from K9 Transfer Factor™, and the Omega 3 fatty acids from K9 Omega™, in an easy to use form. K9 Immunity Plus™ is made from the pharmaceutical grade human quality raw materials and is 100% made in the USA with no imported ingredients. These are highly flavored chewable wafers that most dogs will take with no problem and it's much easier to administer to sick dogs. This is much easier than trying to force capsules down the dog’s throat when they are already feeling bad because of their health problems and other supplements or medications they may be taking. 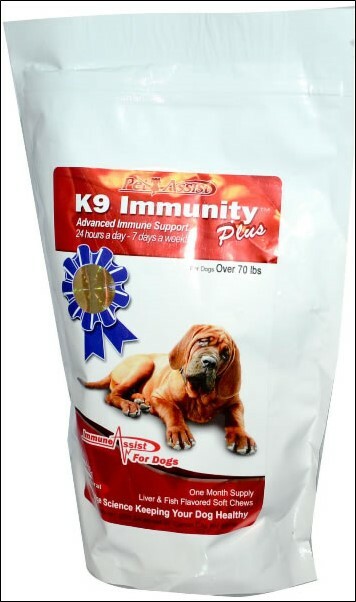 K9 Immunity Plus™ is packaged according to the dog’s weight. By making K9 Immunity Plus™ in an all-in-one format, it is also cheaper to use than the three products purchased separately. 90 chewable wafers for dogs weighing 31-70 lbs. OTHER INGREDIENTS: chicken liver, fish meal, glycerin, lecithin, maltodextrin, potato flour, potato starch, flaxseed meal, calcium propionate, mixed tocopherols, phosphoric acid.